National Cooperative Business Association CLUSA International is the primary voice in the United States for people who use cooperatives to build a better world. Our mission is to develop, advance and protect cooperative enterprise. NCBA CLUSA works to build a better world and a more inclusive economy that empowers people to contribute to shared prosperity and well-being for themselves and future generations. By leveraging the shared resources of the cooperative movement, we seek to engage, partner with and empower people from all walks of life—particularly those left behind by a shifting economy and facing the greatest economic and societal barriers. We achieve this vision through collaborative partnerships in development, advocacy, public awareness and thought leadership. The Cooperative League of America is formally organized, the precursor organization to NCBA CLUSA. The League forms a legal department and successfully lobbies for the passage of a cooperative federation statute in New York, then incorporates as the Cooperative League of the United States of America (CLUSA). 9 out of 10 rural homes are without electric service. President Roosevelt established the Rural Electrification Administration (REA) to electrify rural America through the use of rural electric co-ops. CLUSA joins with other cooperative leaders to launch a public education campaign to defend the tax treatment of cooperatives in Congress. The Cooperative Development Foundation is formed, initially as the Freedom Fund of CLUSA, to help provide war relief through the development of cooperatives and other self-help initiatives in Europe. The first grant ($30,000) helps to launch Cooperative of American Remittances to Europe (CARE). The international arm of CLUSA is launched in response to a request from the Indian Cooperative Union. Through its first overseas office in New Delhi, CLUSA helped develop and strengthen dairy, fertilizer, farm machinery and other co-ops in the country. Working in southeastern U.S., CLUSA takes on a pilot project as part of the War on Poverty that leads to the formation of the Federation of Southern Cooperatives. The Cooperative Hall of Fame is established. Inductees receive the cooperative community’s highest honor. CLUSA changes its name to the National Cooperative Business Association (NCBA). The “CLUSA approach” to sustainable cooperative development is developed in Niger in the mid-1980s. The method is characterized by local decision-making and empowerment, and was developed by NCBA CLUSA veteran innovator Papa Sene. Cooperativa Café Timor is established with support from NCBA CLUSA. Today, CCT offers its 22,000 member-owners access to global markets—including Starbucks—better prices and healthcare through its network of health clinics. NCBA CLUSA proposes and sponsors the .coop Top Level Domain. Many cooperatives and similar trade groups around the world, including the International Co-operative Alliance (ICA), backed the proposal. The technical infrastructure for the .coop TLD was developed by the worker cooperative Poptel in the United Kingdom and became operational on January 30, 2002. NCBA CLUSA’s flagship Feed the Future project Yaajeende is launched in Senegal, based on a comprehensive approach built on the four pillars of food security—availability, access, utilization and governance. NCBA CLUSA leads fight to successfully restore RCDG funding for co-ops. Credit union membership in the U.S. tops 100 million in June. 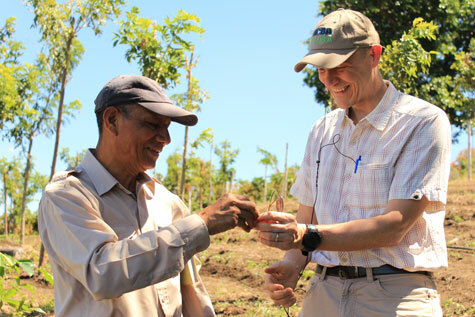 NCBA CLUSA formally launches its U.S. – Cuba Cooperative Working Group in March, positioning the organization to better support Cuban economic progress. NCBA CLUSA receives its first grant from the Starbucks Foundation in April to support the livelihoods of coffee farmers in Indonesia. The first meeting of the Interagency Working Group on Cooperative Development is held in October, a provision NCBA CLUSA worked hard to ensure the inclusion of in the Farm Bill. NCBA CLUSA works with legislators to create the long-awaited bipartisan Congressional Cooperative Business Caucus in December, co-chaired by Rep Ed Royce (R-CA) and Rep. Mark Pocan (D-WI).